HOLMES, SIMON HUGH, lawyer, journalist, politician, and office holder; b. 30 July 1831 in the first frame-house erected in what became Springville, N.S., one of the ten children of John Holmes* and Christina Fraser; m. 23 Dec. 1874 Isabella Jane Little in Haliburton Creek, N.S., and they had four daughters; one of his granddaughters married the future Nova Scotian premier Robert Lorne Stanfield; d. 14 Oct. 1919 in Halifax. The grandparents of Simon Holmes emigrated to Pictou County from Ross-shire, Scotland, in 1803 with their son John and shortly thereafter settled in the area which would become Springville. The family was staunch Church of Scotland and Tory. In 1843 Robert Grant taught Simon Holmes in the red schoolhouse at Springville, and by July 1849 Holmes was attending Pictou Academy. He went on to study law under James McDonald and became an attorney on 9 Aug. 1864 and a barrister on 10 April 1865. In 1858 Holmes had established and become first editor of the Pictou Colonial Standard. The paper was “a dedicated advocate of the principles of true Conservatism” and a foe of “factories of hypocrisy and defamation” such as the Halifax Morning Chronicle and Presbyterian Witness [see Robert Murray*]. One scholar has observed that the paper maintained “a fairly high standard of journalism throughout the Confederation question.” This remark is high praise, inasmuch as Holmes was defeated in 1867 when he ran on the provincial Conservative ticket in Pictou County, though he gained the most votes among the unsuccessful candidates. Four years later he was elected to the House of Assembly for Pictou County, thus following in the footsteps of his father. By 1874 he had emerged as de facto leader of the Conservative party. However, a coterie of Conservative politicians felt the party had to be strengthened. Led by James McDonald and Senator William Miller, and abetted by Bishop John Cameron*, they prepared “a little conspiracy for the subjugation of Antigonish” and thereby brought John Sparrow David Thompson* into the house in an 1877 by-election. On 17 Sept. 1878 the Conservatives won the provincial election; Holmes became premier and Thompson attorney general. On assuming office on 22 October, the new government inherited a mess. The outgoing Liberal administration of Philip Carteret Hill* had spent its 1878 budget, an additional $156,000 of its 1879 federal subsidy, and $59,000 received from the federal government for railway stores. As well, six days prior to the issuing of the election writ it had secretly appointed four Liberals to the Legislative Council. A depleted treasury, to be further drained when the “better terms” grant ceased in 1879, a hostile majority in the Legislative Council, and a railway conundrum which obsessed Holmes throughout his premiership dictated the initial actions of the government. To unload part of the financial burden, Holmes determined to make roads and bridges a municipal responsibility. On 4 April 1879 a county incorporation bill was introduced. 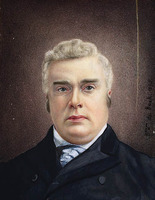 The creation of Charles James Townshend, a minister without portfolio, and modelled on the New Brunswick legislation of 1877 [see George Edwin King*], it imposed upon the municipalities the necessity of direct taxation in order to raise $55,000 for the maintenance of roads and bridges. Other legislation provided for a lengthening of the training period for prospective teachers; the subsidization of education for blind children; the improvement of mine safety after the Foord pit explosion of 1880; and reforms in the judicial system – the last a Thompson priority. In the area of finance, per capita spending decreased from $10.03 to $5.65. Success for the administration did not come easily. The Legislative Council, led by Thomas Fletcher “Rolling Billows” Morrison* and quietly encouraged by William Stevens Fielding*, the managing editor of the Morning Chronicle, rejected government initiatives, including at least one money bill. When in 1881 it turned down legislation to abolish the University of Halifax, a secondary casualty was the grants the government provided to institutions of higher learning. On three occasions Holmes attempted without success to abolish the council. Frustration within the government grew – frustration with Sir John A. Macdonald*’s federal administration, which seemed indifferent to the financial concerns of Nova Scotia, frustration with a continued lack of railway consolidation, frustration among Holmes’s colleagues with his style of leadership. This final annoyance resulted in a palace revolt which saw Holmes give up the premiership on 23 May 1882. Although some cited ill health as the reason for his resignation, Holmes immediately accepted a government position. If Holmes’s departure from public life was crude, his new position was lucrative. As protonotary and clerk of the crown for Halifax County in the Supreme Court of Nova Scotia, he received not only a substantial salary but also fees for each document he signed. In 1883 a Liberal government capped the total income at $3,000. Holmes could take some satisfaction that the municipal structure he put in place resisted all attempts at change and that with the socalled syndicate legislation of 1882 he had laid the groundwork for the resolution of the controversy over the consolidation of the railways. Railways would continue to interest him. He served as president of the Stewiacke Valley and Lansdowne Railway and was later a promoter of the Midland Railway, which linked Windsor and Truro. By the turn of the century he was a man of some means, and his wife entertained with grace and style in their magnificent home on Inglis Street, designed by William Critchlow Harris. He died at the Queen Hotel, Halifax, on 14 Oct. 1919 and was interred in Camp Hill Cemetery. Holmes’s old newspaper, the Colonial Standard, spoke often of his “probity, courtesy and diligence, as well as ability.” But even the stern stuff of a Pictou County Scot and Church of Scotland adherent could not overcome the political challenges of the day. 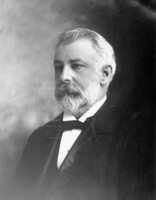 As an observer has written, “Economy and innovation combined, even if they meant reform, were fatal to political aspirations.” Indeed, in 1926 Edgar Nelson Rhodes*, the first Conservative premier elected since 1882, was admonished by a federal mp: “We had a Local Government from 1878 to 1882 which affected great reform in our Municipal administration and passed considerable wise legislation. Unfortunately, they lost sight of the practical side, with the result that we went out and stayed out for forty years.” The Nova Scotian voter has a long and seemingly unforgiving memory. A charcoal portrait of Simon Hugh Holmes which probably dates from the time of his premiership is held by a descendant; a photograph of it is available at the PANS. A good photograph of Holmes appears in Beck, Politics of Nova Scotia, 1: 175 (cited below). On 19 June 1993 the Pictou County Hist. Soc. unveiled a monument to commemorate the lives and careers of Senator John Holmes and his son Premier Simon Hugh Holmes on the lawn of the Presbyterian church in Springville, N.S. PANS, MG 2, 554–61. Morning Chronicle (Halifax), 15 Oct. 1919. J. M. Beck, The government of Nova Scotia (Toronto, 1957); Politics of Nova Scotia (2v., Tantallon, N.S., 1985–88), 1. F. W. Calder, History and stories of Springville, Pictou County, Nova Scotia (Windsor, N.S., 1992). J. M. Cameron, Political Pictonians: the men of the Legislative Council, Senate, House of Commons, House of Assembly, 1767–1967 (New Glasgow, N.S., ). Canadian biog. dict. Cyclopædia of Canadian biog. (Rose and Charlesworth), vol.2. Waite, Man from Halifax. 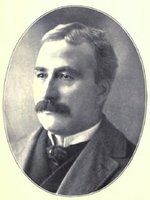 Allan C. Dunlop, “HOLMES, SIMON HUGH,” in Dictionary of Canadian Biography, vol. 14, University of Toronto/Université Laval, 2003–, accessed April 24, 2019, http://www.biographi.ca/en/bio/holmes_simon_hugh_14E.html.